After watching our funny little HGTV show, I realized that people (ahem…Americans) probably think we are nuts for choosing a home with one tiny bathroom and zero closets, no garage and the smallest budget HGTV has probably ever seen. However, most of that was quite intentional, and I decided to share the WHY behind why we chose our home. I grew up in a rather large home which had three levels. It was not uncommon for us to be so spread out in the house that we had to shout to locate the person we were looking for. After living in a billion tiny apartments in my twenties, I quickly learned to love the close proximity I was to my family, the ease in which it was cleaned, and the constant purging of clutter so that we could enjoy our small space. As I’ve gotten older, I’ve learned to embrace the freedom and joy that comes with living simply. Can I tell you, I was excited about having no closet space? Because closets attract clutter and unnecessary belongings and make my heart anxious. That old adage, “less is more”? It’s so true. I used to be unable (unwilling) to part with anything as a youngster and it all got hidden in parts of our extra-large house~ in the crawl space, in the back of closets, in useless dresser drawers. Until one day when I had to go through all of it. Gasp. Barf. Disbelief. “Not my old junk? Didn’t it disappear into the realm of crawl-spaciness?” You guys. 1,000 My Little Ponies. 2,000 Cabbage Patch Dolls. 3,000 Trolls. I can’t even. Worst day ever. After sorting through gobs of leftovers from the 1990’s, I vowed to NEVER let it happen again. Junk does not bring joy. People do. God does. But not junk. This summer, I kept hearing excitement from two friends in two different states, who were reading the same book. Intrigued, I ordered it on Amazon. The Life Changing Magic of Tidying Up. It’s brilliant. The concept is that you ONLY own the things that bring you joy and are useful to you. So, in a “marathon” of tidying your belongings, you physically touch everything you own and determine its fate. So far, I’ve only tidied my clothing, but I feel so F R E E!! And let’s be real for a sec…the fact that “paperwork” is a thing to be tidied, has made me put the book down and read less terrifying books, but it’s brilliant, nonetheless. I simply cannot wait until our home ONLY has useful things filling its hidden spaces. My closet (IKEA wardrobe closet) after the great purge. Other than my pajamas and folded shirts in my dresser, this is it folks. No hidden bins of clothes anywhere, none smooshed into the top of the closet…only things that I get excited to wear. I love it. 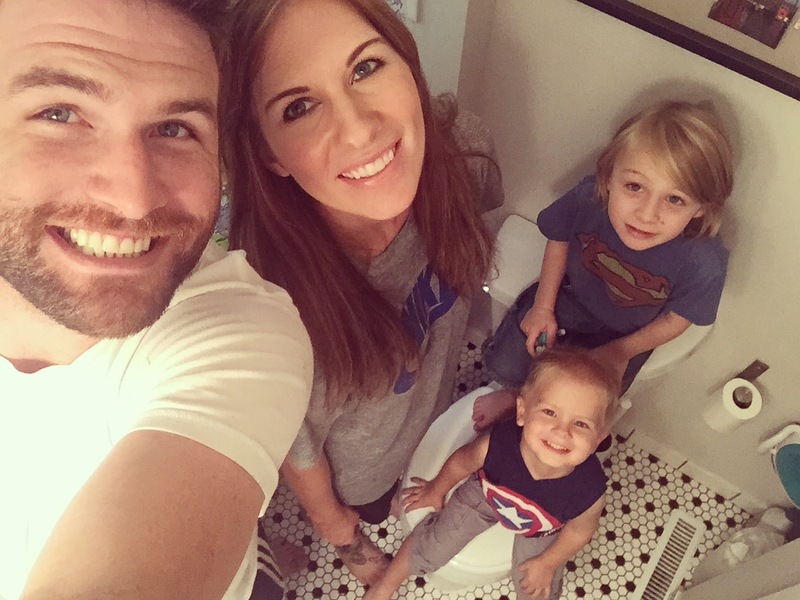 So many people have asked me this past month, “How’s it going with one bathroom?” Let’s see…9 months in and we are still alive. My sons have peed outside several times (to their utter delight) and we’ve only had a couple of REALLY uncomfortable situations. <insert poop emoji> My favorite moments are when one of us is in the shower, one on the toilet, and two kids + lazy Basset Hound filling in the gaps. 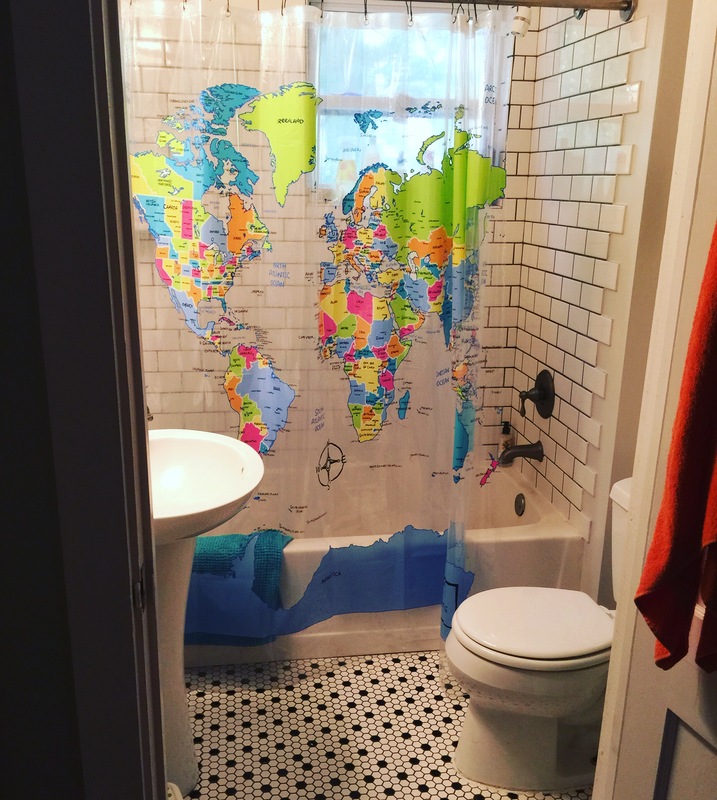 I can’t wait for that conversation 30 years from now: “Remember when we lived in that one house that had a bathroom the size of a postage stamp?” <Ensuing laughter> And then I think of the billions of people who would be THRILLED to have our one mini bathroom. And I’m humbled. Our mini bathroom. I can clean it top to bottom in less than 10 minutes. Win. It’s okay not to follow the American Dream. It’s okay to want less instead of more. And it’s okay if everyone thinks you’re nuts in the process. I have a dear friend from back home who has a wonderful little blog called Smallish. She talks all things simple from living in small spaces to living green. Check it out. And if you decide to make a home with no closets your own, we are soul sisters. OH my gosh I love everything about this post!!! 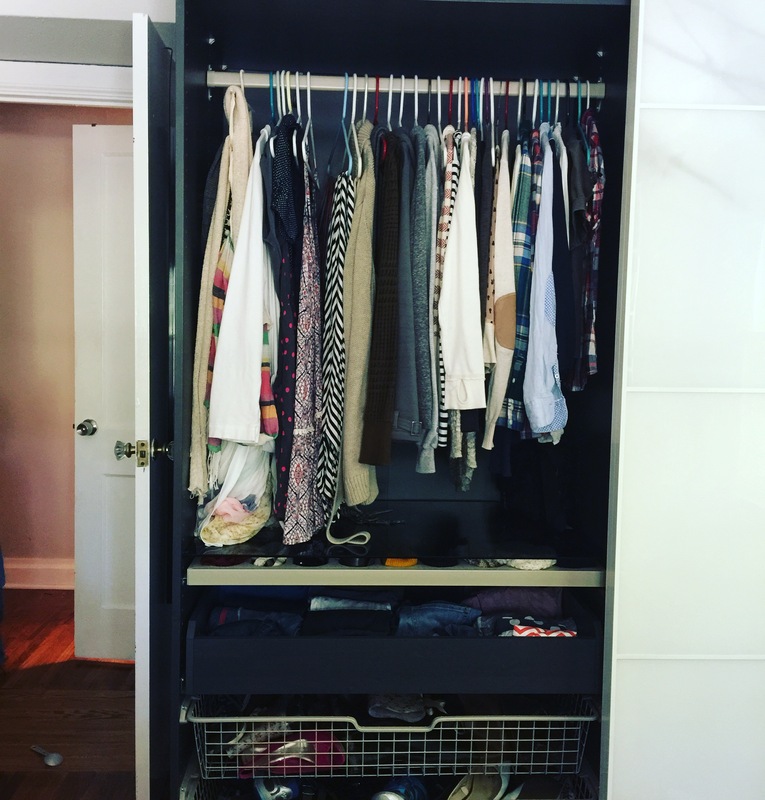 I love what you said about closets: “Because closets attract clutter and unnecessary belongings and make my heart anxious.” … I never realized it before, but YES! Me too!